We drove on over the dual carriageway A120 (connection Stansted to the East) and under the disused railway line (which, at a fraction of the cost, could have linked Stansted and Braintree as it used to) – http://www.disused-stations.org.uk/f/felstead/. 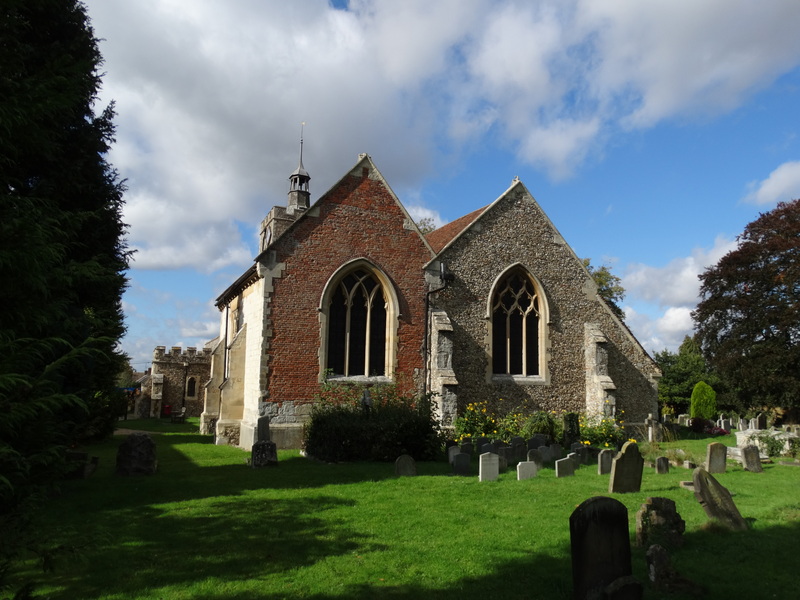 Through Felsted School – http://www.felsted.org – and parked next to Holy Cross church – TL676204. 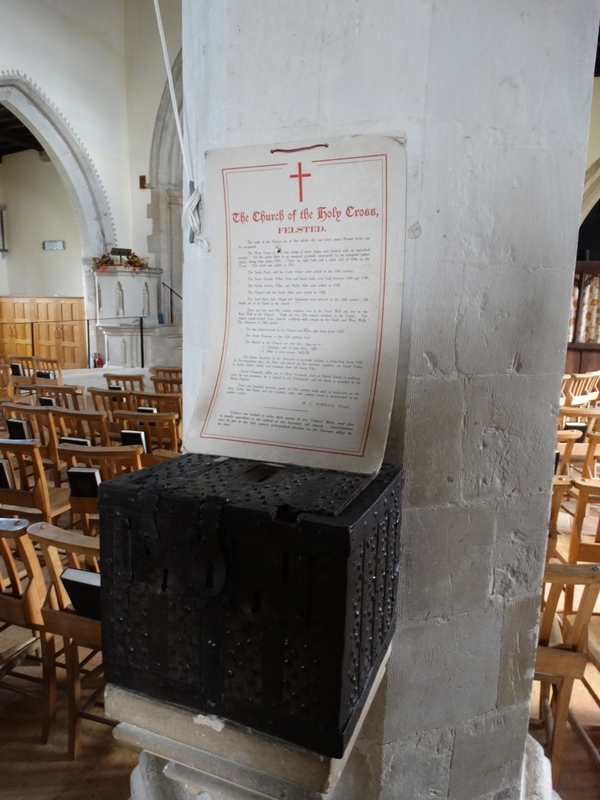 Just inside the door is a lovely old offering box and a card giving the history of the church. 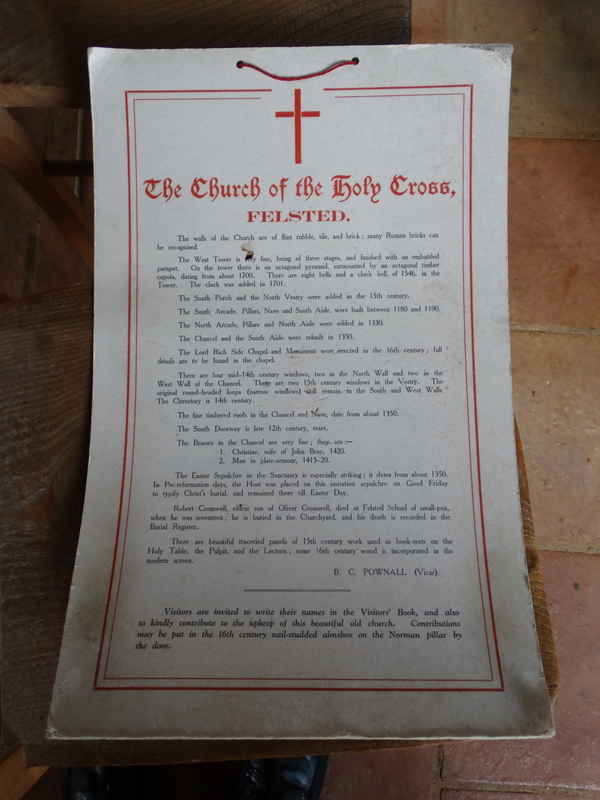 The card has been replaced by a very professional guidebook – and their church magazine is in full colour too. 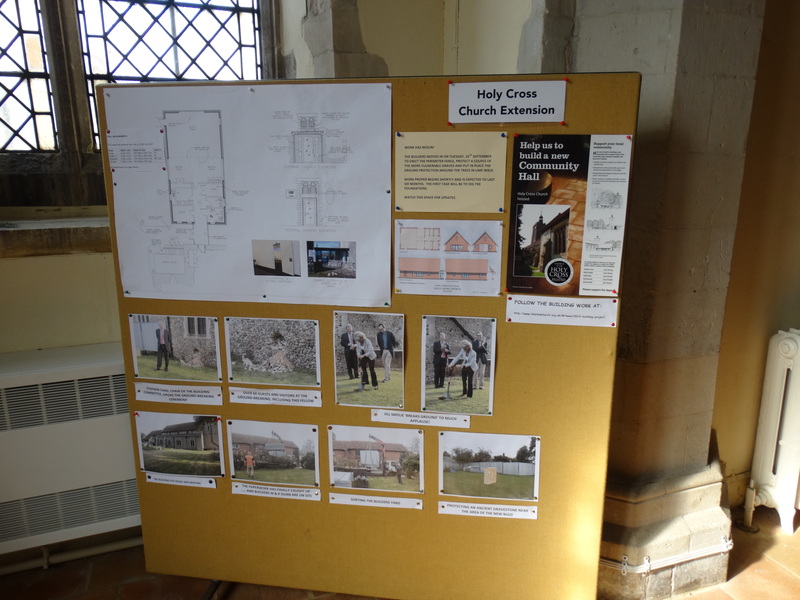 Lovely cartoon about the PCC on a noticeboard – if you don’t know these Dave Walker cartoons, look at http://www.cartoonchurch.com and enjoy. 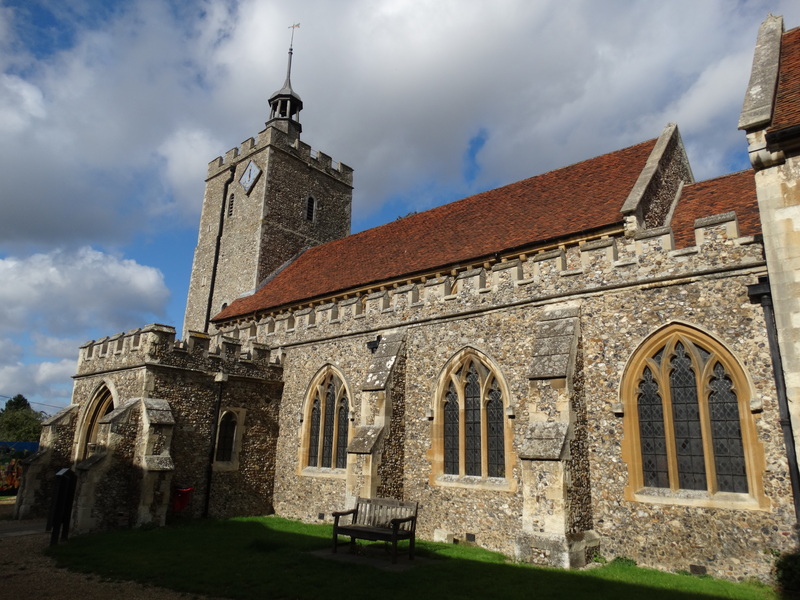 The manor of Felsted, presumably with a Saxon church, was given by William the Conqueror to his brother, the Bishop of Bayeux. 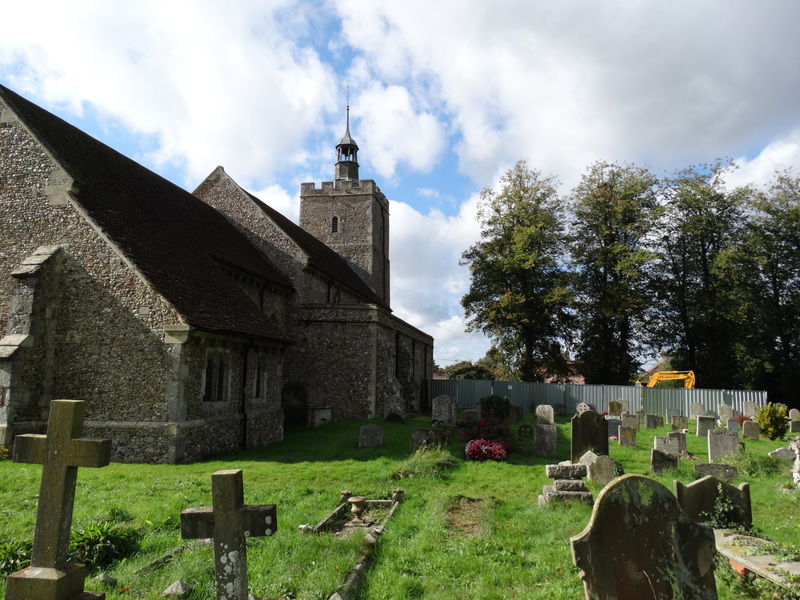 The tower is Norman and most of the rest of the church seems to be 12th century. 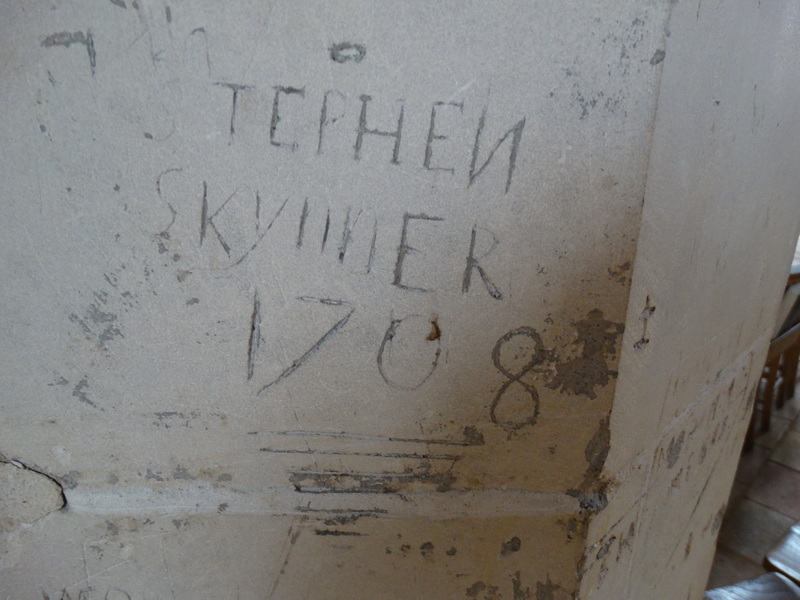 This graffiti is later – I wonder if he was thrashed for it? 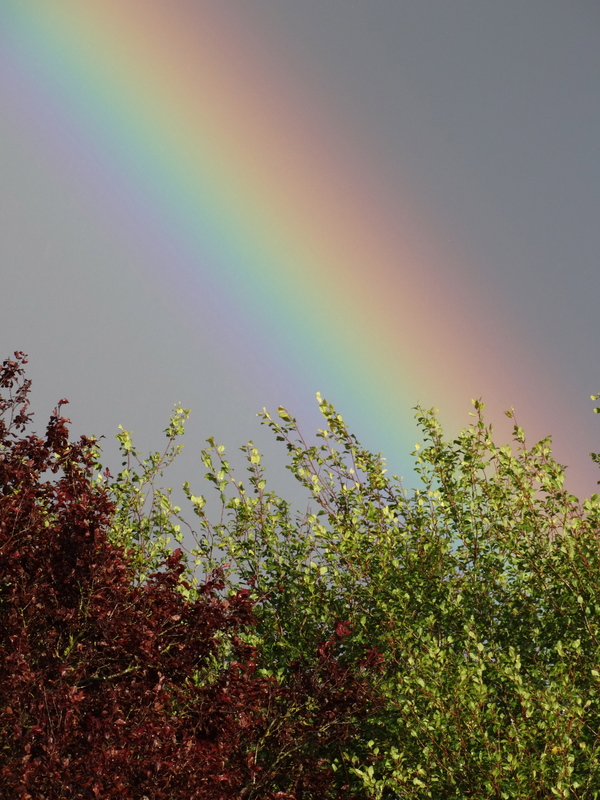 More about schools and school masters later in this blog. The interior was replastered in the 1870s and the Victorians did a lot of work. 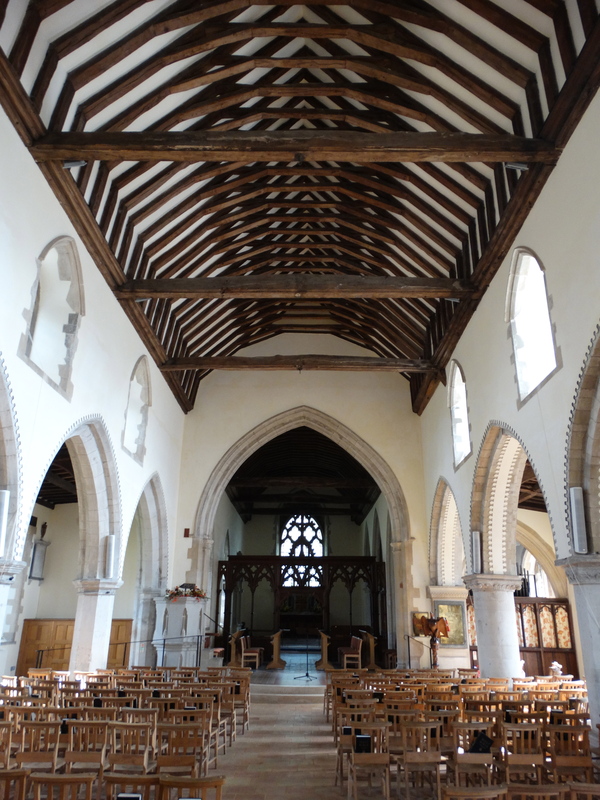 The floor was replaced more recently, when the Rood Screen was moved east, and the platform made in front of it. 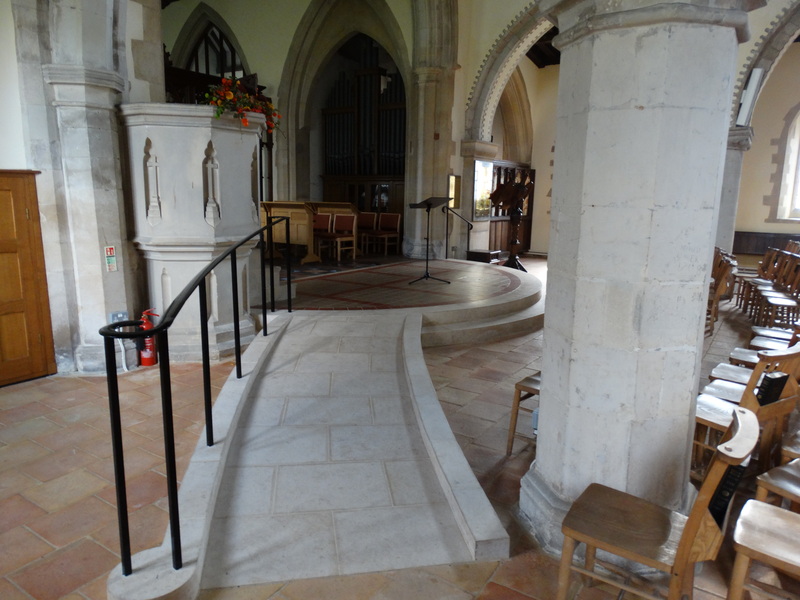 What a nice, sensible, ramp. 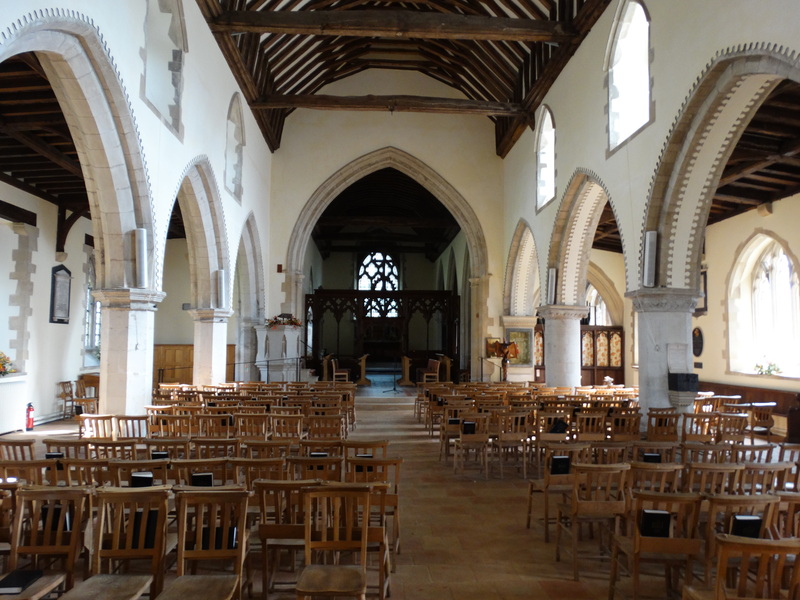 Some better chairs would be nice, and could add some colour – that is what this church is missing. 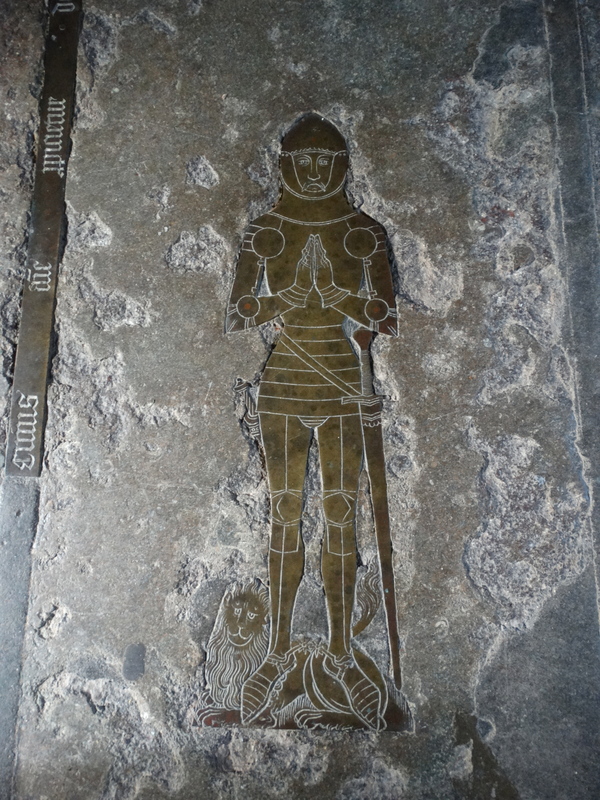 This rather nice knight is in the Chancel – a 2 feet image of a man in plate armour dated 1414. No one knows who he is. 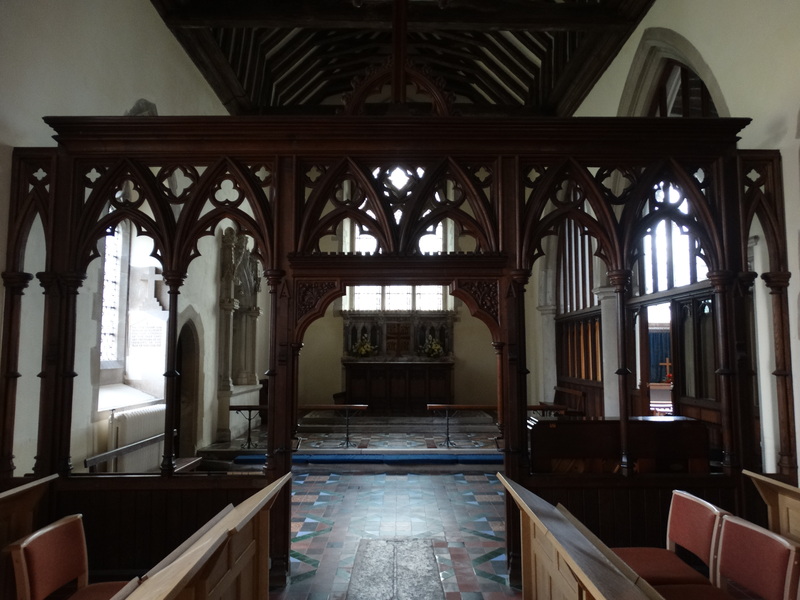 Otherwise the Chancel is not very stunning – and I’m not sure that they have cured my “what do we do with the Chancel” problem! 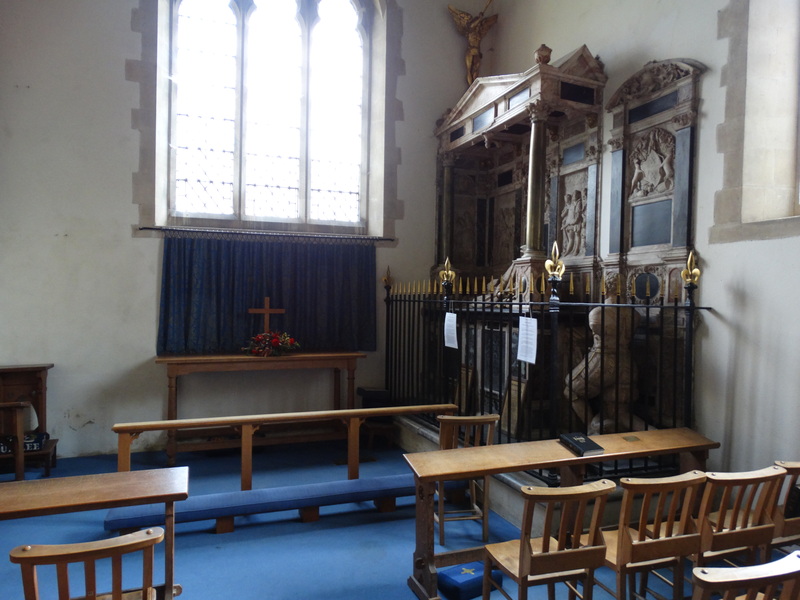 The most stunning part of the church is the Riche Chapel – also good from the outside. Richard Riche purchased the manor at the Dissolution in 1537 – he did very well out of the destruction of the monasteries. 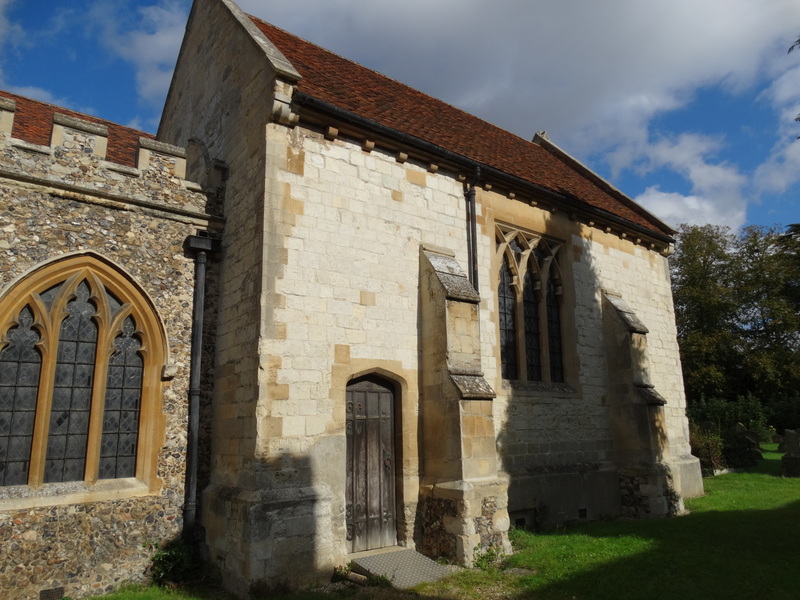 He founded a school in 1564 – within a century Oliver Cromwell’s sons would be educated here, and it continued to grow through the reign of Queen Victoria and into the 20th century. 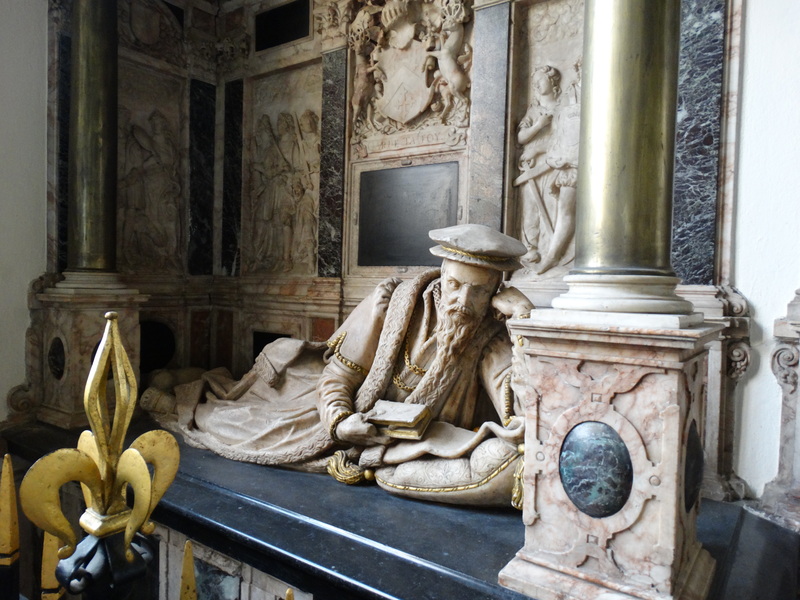 On this Memorial he is the reclining figure, wearing his robes, round cap and ornaments of the Lord Chancellor. 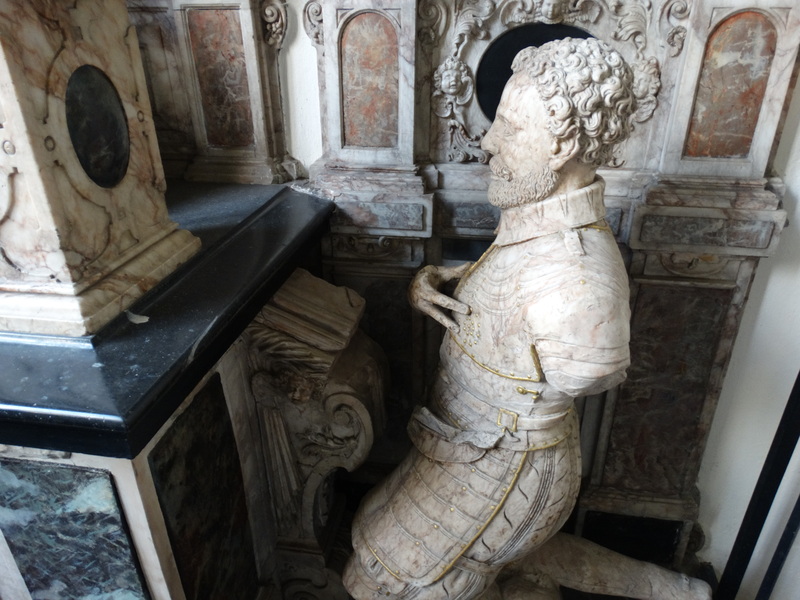 The kneeling figure on the right is Richard Riches II, who died in 1581. He wears the court dress of the period. 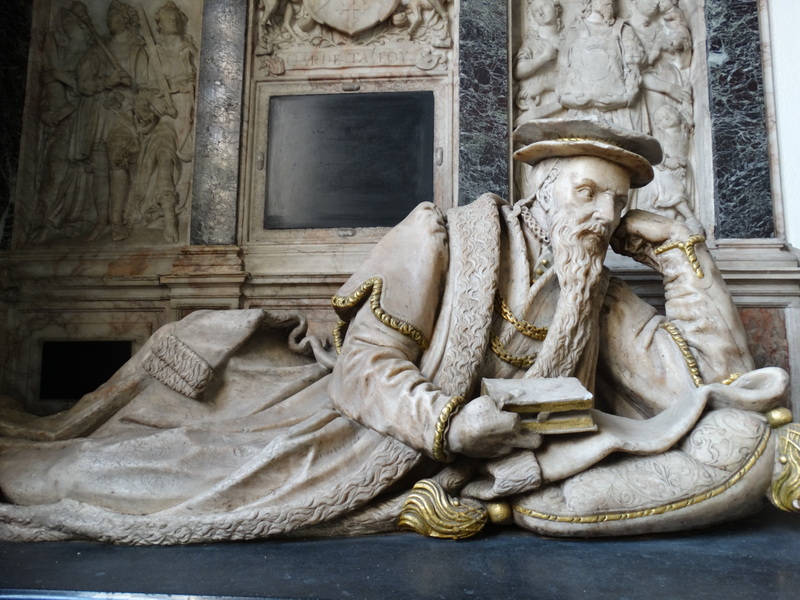 His right hand is ungloved so he can turn over the pages of his Prayer Book. 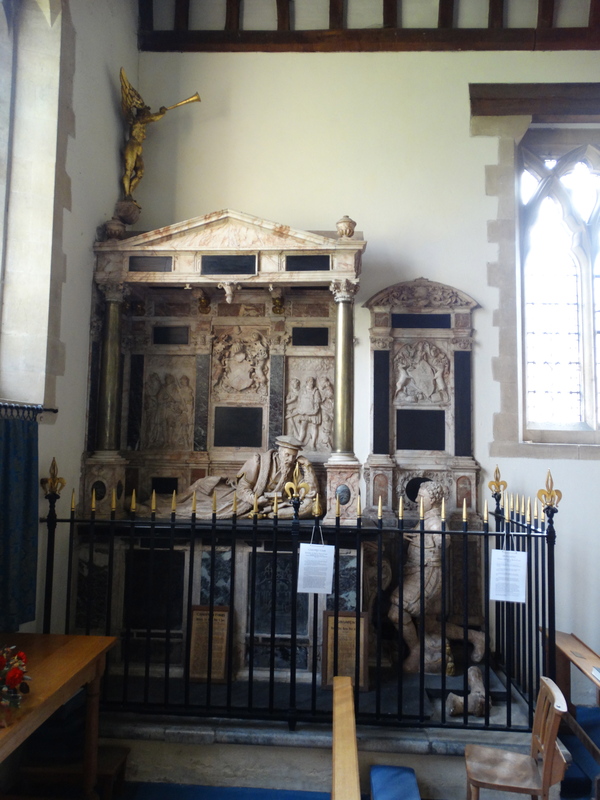 The monument was paid for by Richard III, and the sculptor was either Epiphanius Evesham, or his pupil Isaac James. 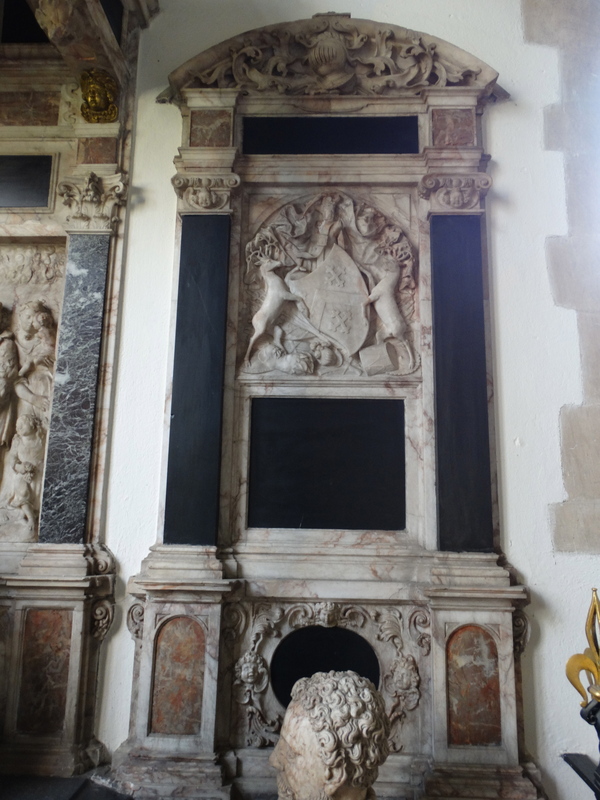 It dates 1610-17. The railings were added in 1914, and the monument was given a good clean and re-gild in 1964 to celebrate the school’s 400th birthday. An interesting gravestone. I looked him up. 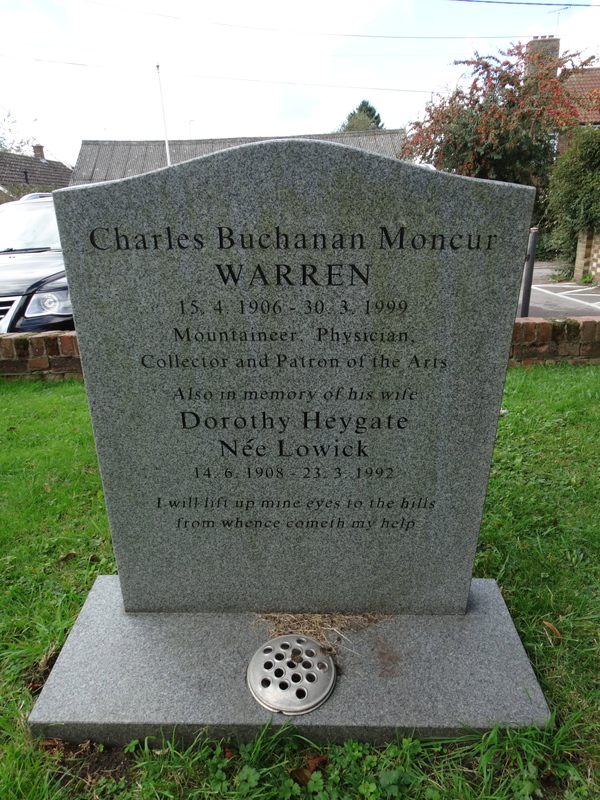 Charles Buchanan Moncur Warren climbed on Everest in the 1930s. 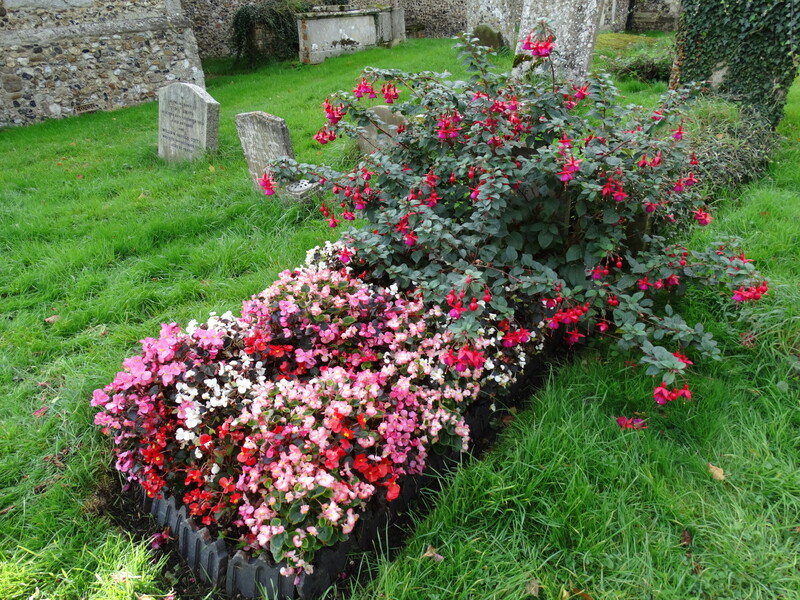 Later he was a paediatrician in Chelmsford for many years. More about him at http://munksroll.rcplondon.ac.uk/Biography/Details/5041 and his obituary at http://www.independent.co.uk/arts-entertainment/obituary-dr-charles-warren-1093406.html. Apparently he described the first Everest expedition as “‘the logical extension of an alpine holiday’. It was certainly a delightful expedition, under the imaginative leadership of Marco Pallis, a keen Tibetologist who was also an accomplished Baroque musician, entertaining mountain shepherds on the Indo-Tibetan watershed with early English viol music.” What a wonderful vision! 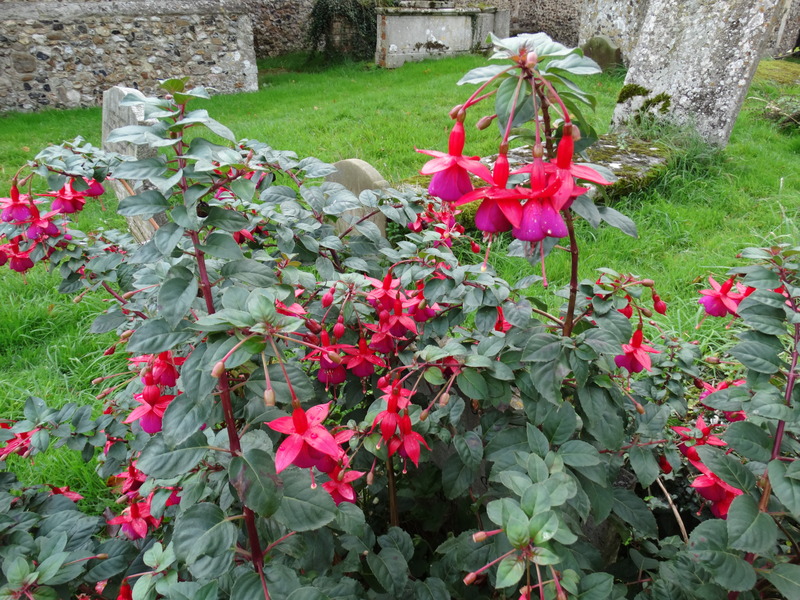 Lovely fuchsias in the churchyard too. 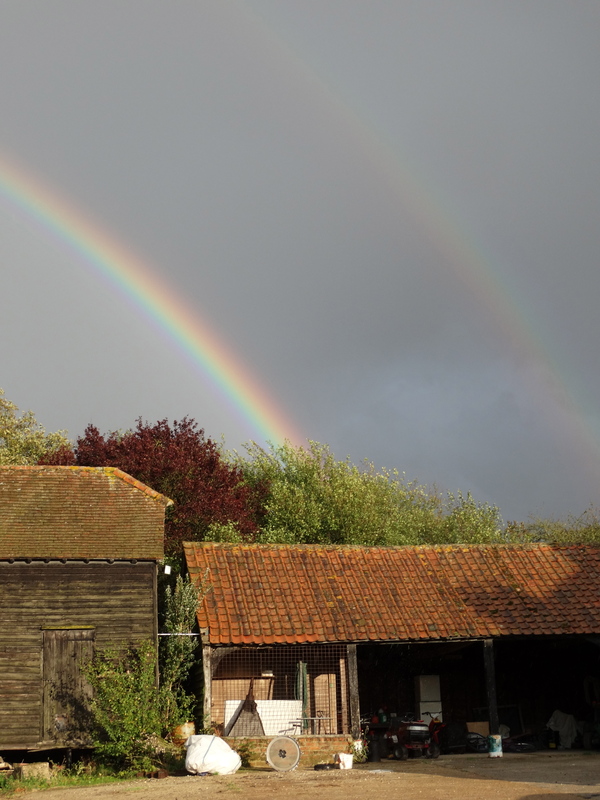 That evening we enjoyed a double rainbow over the Farm.